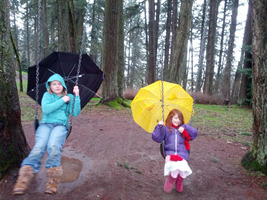 We had a very wet weekend, which didn't stop me from dragging the kids outside. 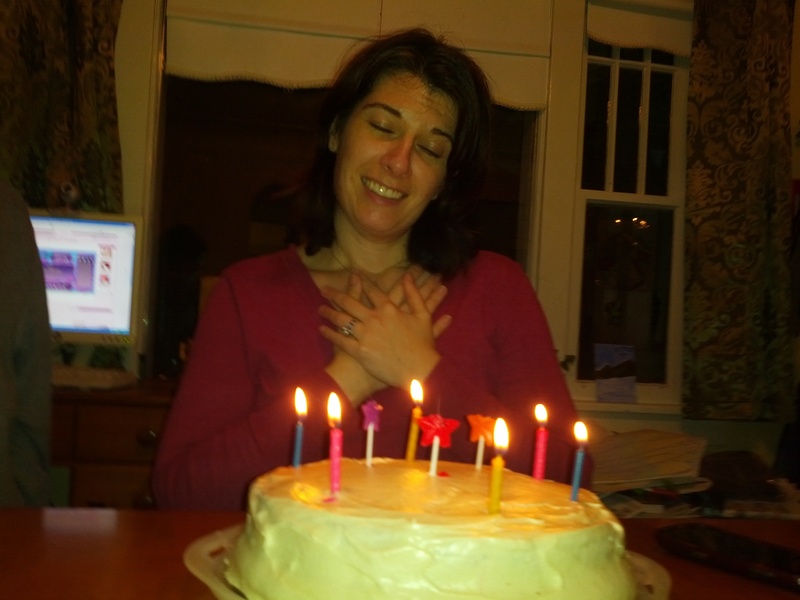 Joanna was feeling cruddy on Friday, so we canceled our date night and just hung out at home. Saturday morning I picked up Emma. She and I got her new computer set up - she spent a good long while picking the right background wallpaper. It runs games nice and smooth, which was my overall goal. We played Sims Medieval and built up Queen Emma's kingdom. Fortunately Emma's a fairly benevolent leader. I took all the younger kids out to Hendrick's Park for a picnic. It started raining and we ended up eating under the covered tables and then briefly swinging in the rain. We quickly rushed off to the library to pick up books. Upon our return, everyone had a long quiet reading time. Sam arrived later that night and we did our usual pizza and Bang Goes the Theory. Sam and I played a bit of the free-to-play Diablo-like game Path of Exile together. It's pretty amazing, especially for free. We also made Joanna watch Primer with us, one of my favorite time travel movies. Sunday at noon I took Sam, Emma and Berry for a long walk down to get our hair cut. We ate lunch at the Glenwood, with Sam eating massive quantities of food. He's nearly six feet tall at this point, and I think he's got some more growing to do. They kids all played well together, and were very patient waiting for things. Joanna returned with Duncan after church and a birthday party, and we settled down for a quiet evening. Okay, it was really Mocha Friday today. I worked from home, which was strangely productive as always. I got my big provider compensation project ready to go live, as well as lots of little things that had been sitting around waiting for my attention. I managed to get out to have coffee with mom. She gave me a tour of the house that she's building in her back yard. It looks pretty amazing so far, though there's lots of detail work to do. There's a cool room at the top with a balcony that has a gorgeous view. Joanna has the cold now, so we canceled our date night and stayed at home. The kids watched the second Harry Potter movie, as they finished the book. I tidied up and worked on getting Emma and Berry's new computer ready to go. I think the barista put in a double shot in my Thursday mocha. I haven't quite thrown of my clothes and run screaming through the cubicle farm, claiming to see god, but it seems like an increasingly good idea. I had a mocha today as I'm working from home tomorrow, as it's a no school day. It's only fair. Life's doing okay. Jamie reported that Emma is still sick. I'm finally feeling pretty normal. Sam's mostly caught up with homework, though I think he has some papers due on Monday. I'm putting together a new computer for Berry and Emma. Evidently my six year-old computer isn't even powerful enough to play Moshi Monsters effectively. Sadly both it and Joanna's computer are more powerful than mine. I'm loving the new counter space in our bedroom. I sprawled out all the computer parts and threw it together quickly. It's nice having a place I can mess up and leave it as-is for a few days. Other than the cold and dusty garage, I haven't had a good craft table for a long while. Joanna had her birthday yesterday, an event that started on Sunday when we had all the kids. I was pretty sick all weekend, so she ended up making herself a cake. We sang the songs and showered her with presents. The cards that all the kids made were dutifully read and cherished. Monday was pretty low-key, with Sam and Emma going to Jamie's in the afternoon. Sam and I worked on programming, getting pathfinding working for his Java game. All the kids spent a bunch of time playing Wii Fit, in our attempt to get them more active. I started working on a crazy virtual reality thingie, tying the forward key in games to the treadmill speed slider. The programming is good to go, including the signal to the Lego Mindstorms robot, but I'm running into hardware issues with pistons. My annoying cold is finally getting better. I think everyone else is doing well. Sam had a ton of homework last night from his day he missed school. After two and a half hours of math and writing, we called it quits. Today is the rest of the math and a bunch of Spanish. Ah, midterms. Everyone's been sick off and on this last week. It finally became my turn to get the full-blown cold yesterday, and I'm slowly on the mend. I worked from home Wednesday through Friday to keep an eye on kids. I'm usually strangely productive when I work from home, but the volume of work was so huge that I had a hard time keeping up. I finished the upstairs counter top, and enlisted Sam and Joanna's help to put it into place. I really like having a work area up there, which I immediately put to use assembling Joanna's new computer. She got fed up with her six year-old laptop, so I got her a hefty desktop computer that's better than mine. Sniff. More parts arrive to replace the one Emma and Berry use later this week, which is equally ancient. Despite my sniffles, I managed to take the kids on a walk down to Euphoria chocolate to pick up some chocolate covered espresso beans. Sam was funny goofy and kept Berry and Duncan laughing. Emma and I just pretended we weren't with him as he did his funny cat dance. Later we played worm in the basement, with Sam chasing and devouring everyone while wearing the blue tube. I'm hoping to take it easy today and tomorrow, though life with six people in the house is always a little frantic. Joanna and Berry folded laundry yesterday and I couldn't stop thanking them. The weekend has faded, and we just got home after a fairly lengthy day at work. I was pretty stressed out Saturday morning due to all the crazy work stuff, but fortunately Emma and Berry decided to play pretend with me. I was evidently their ailing father and I got to play with a cool light-up toy while they stuffed me in a tent and brought me random imaginary food. Eventually I perked up enough to redecorate Emma's room with her. It turned out really well. 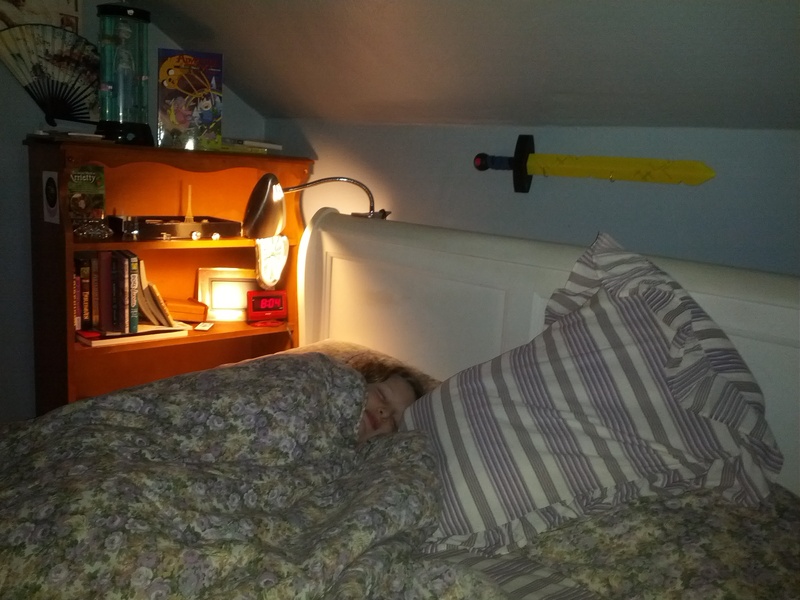 We got all the junk off the floor, moved a bookcase, and put her bow and Adventure Time sword on the wall. She spent a long time arranging her book case, and we were both happy with the result. The rest of the weekend was fairly routine. Sam came over and we had pizza and Bang Goes the Theory (Mythbusters isn't playing at the moment). Sam and I did a bunch of homework and I helped him with his persuasive essay. The topic he came up with was "would you rather fight a horse sized duck, or a hundred duck sized horses." After careful analysis, we went with the horse sized duck. I took Sam, Emma, and Duncan down to the park on a cold Sunday afternoon. We ran about, trying to stay warm, then returned home for cocoa. I worked on the counter I'm building for the upstairs office area, which is slowly coming along. Last weekend Sam cut a snip of Emma's hair for some reason. Fortunately she made the best of things, and gave herself a mustache. I'll be picking her up soon on this frosty winter morning. I've been fiddling with the the web site, trying to get an editor that'll work with my phone. I think I also fixed a quirky IP address issue, which theoretically means there will be less downtime. My stress levels are a little high this week. Both vehicles had their "check engine soon" lights blink on a couple days ago. Child support calculation discussions start soon with Jamie. Next week I get to apply for my job again. On the plus side, it's Friday, the kids are generally doing okay, and it's date night tonight. Of course, there's a chance we spend it at Urgent Care, getting Joanna some antibiotics for a sinus infection, but I'm sure we can break out the candlelight and champagne in the waiting room. It snowed a little yesterday, which was charming. Nothing stuck, unfortunately. I had this dream of getting snowed in with the kids, staying warm by the fire and playing board games. Maybe in a parallel universe. We're about ready to head out the door to work after a three day weekend. We're all a bit groggy, especially the kids who haven't been to school for a couple weeks. The weekend was generally pleasant. I accomplished a bunch of things on our project list. The Christmas tree and decorations are packed away. We had some good hang out time with the kids. Sam played the latest Zelda game until his legs were tired. Life's okay. I was insanely productive yesterday, with Emma assisting and puttering in the workshop herself. I unclogged two sinks, cut 1/4 inch off the top of the bathroom door so it wouldn't stick, and changed the tail light in the minivan. I also started assembling the countertop for our bedroom office area, gluing and clamping the boards together. Emma handed me parts and tools, and did her own little project. She started with a board and hammered in nails to make table legs. 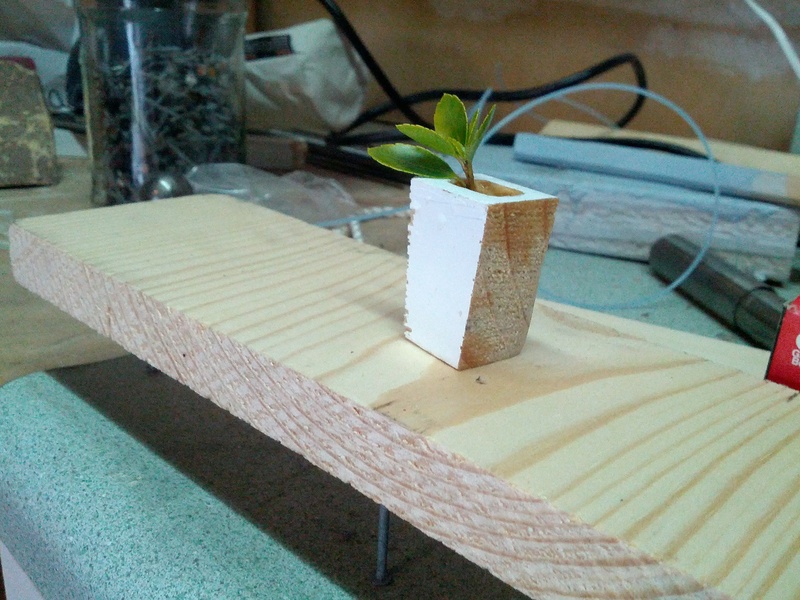 Then she carved out a little vase. Eventually she added a table cloth and napkin holder. It turned out pretty cute. I'm slowly working on my Friday mocha. It's been relatively quiet the last few days, other than poor Joanna who finally got the cold that Berry, Emma, and I had. She's been smelling of Vick's vapor rub for a few days now. Work has been up and down, with rumors flying everywhere. I think I get to apply for my job in a week or two - we'll see how that goes. I've gotten reassurances from everyone that my position is safe and secure, but nothing is a sure thing. Keep calm and carry on. Berry continues to impress me with her intellect. She was talking about a sarcophagous, learned from watching Garfield. 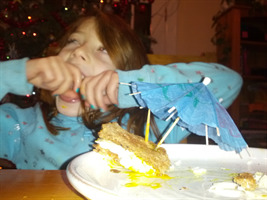 The two of us had dinner last night, and she ate her egg sandwich with a drink umbrella stuck in it. It was difficult, but apparently fancy. Jessica's last day watching the kids is today, and then it's back to the normal grind next week. We're taking Monday off to hang out with kids. I think we're meeting the new babysitter Brenna then as well. We Skype interviewed her, which went well. 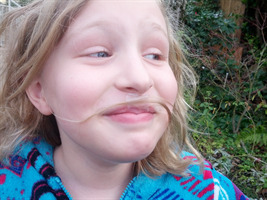 Sadly our previous sitter, Haylee, has gone off to sea, presumably to become a pirate. I look forward to seeing Sam and Emma tonight after work. The weekend should be relatively low-key. 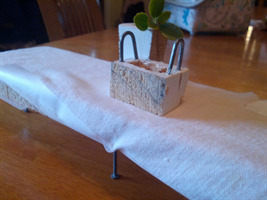 I have a long list of house projects, from unclogging drains to building a counter. We'll see how much enthusiasm I have.